Visit the popular 9-11 Museum in New York City. Avoid hour-long lines with prebooked tickets. 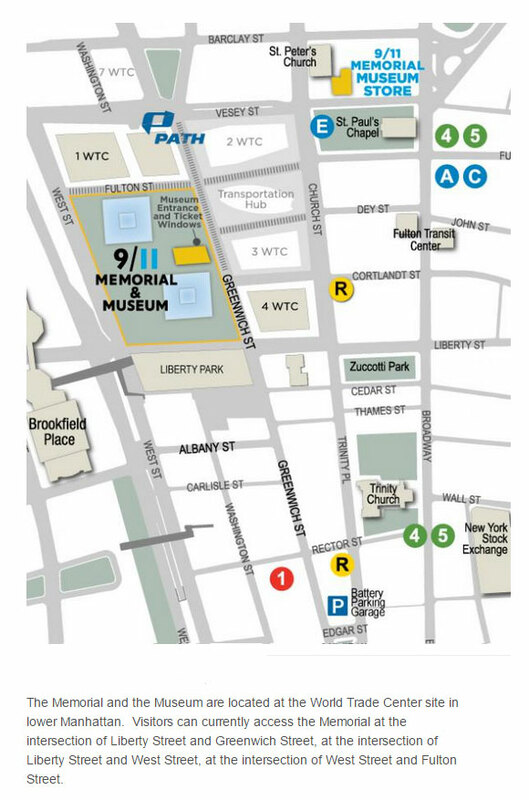 You'll receive a timed ticket of admission for the museum and perhaps you'll also wish to visit the 9-11 Memorial before or after. The 9-11 Museum serves to explore the implications of the events of 9-11, documenting the impact of those events and exploring 9-11's continuing significance. The memorial is a tribute of remembrance and honor to the nearly 3,000 people killed in the terror attacks of September 11, 2001 at the World Trade Center site, near Shanksville, Pennsylvania, and at the Pentagon, as well as the six people killed in the World Trade Center bombing in February 1993. The museum displays monumental artifacts linked to the events of 9-11, while presenting intimate stories of loss, compassion and recovery that are central to telling the story of the 2001 and 1993 attacks and the aftermath. It also explores the global impact of 9-11 and its continuing significance. The museum also has web-based interactive timelines chronicling the events of the 1993 World Trade Center bombing, September 11, 2001 and the nine-month recovery effort at ground zero. The timelines use images, audio and video as well as first-person accounts that are part of the 9-11 Museum’s permanent collection. When you book your tickets, choose a time that suits you, you can book every half hour on the hour. Please arrive at the museum 30 minutes before your time. Since the tickets are timed and need to be issued with your name, booking number and time it might take up to 48 hours before you receive the actual e-ticket by email. Just print out your ticket and bring it with you to the 9-11 Museum. Where is the memorial and the museum located? The memorial and the museum are located at the World Trade Center site in lower Manhattan. Visitors can currently access the Memorial at the intersection of Liberty Street and Greenwich Street, at the intersection of Liberty Street and West Street and at the intersection of West Street and Fulton Street. How much time should I expect to spend at the memorial and museum? An average visit takes approximately two hours. Please note that everyone has to go through the security line in order to enter into the museum. Yes, child rates are available for children between ages 7-17. Children under age 7 are free, when accompanied by a paying adult. Open Daily Sun-Thurs, 9 AM- 8 PM. Last entry at 6 PM Fri & Sat, 9 AM - 9 PM. Last entry at 7 PM When you book your tickets, choose a time slot that suits you. You'll get your exact time on your e-ticket.